A leading think-tank is predicting it may take another five years for income per head to return to the level it was before the recession hit in early 2008. The National Institute of Economic and Social Research (NIESR) sees total UK GDP falling 4.3% in 2009 before growing 1% in 2010 and 1.8% in 2011. This echoes earlier NIESR forecasts but suggests a slower rate of recovery. NIESR expects government borrowing to hit £165.7bn this year, less than the £175bn the government predicts. The research body sees income per head - GDP per capita - taking until March 2014 to return to the level it was in the first quarter of 2008, when the recession kicked in. "The introduction of a more credible plan to return the public finances to a path of fiscal sustainability remains a necessity," NIESR said. And assuming the government keeps to tax plans set out in the Budget, NIESR sees public borrowing hitting £165.7bn in 2009 - or 12% of GDP. Even taking into account "more aggressive curtailing" of public sector spending, this figure would remain at £121.6bn in 2013/2014. The research body predicts heavy cuts in spending in addition to a rise in taxes over the following four years, to mitigate the significant debt. Data released on Tuesday showed total outstanding government debt in the UK had hit a record £799bn, or 56.6% of UK GDP - the highest since records began in 1974. Lower tax receipts as the economy shrinks put new borrowing in June at £13bn, almost double the same month as a year before. "With the rapid accumulation of debt under way, debt interest payments are also expected to increase as a share of GDP over the next few years" said NIESR. "This suggests that spending on goods and services by the state will have to be squeezed significantly". The think-tank sees the economy as a whole returning to the level it was in 2008's first quarter, before the downturn hit, in 2012. And like other forecasters, NIESR sees unemployment rising until mid-2011, peaking at 9.3%. 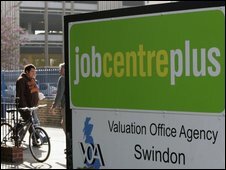 On Friday, the UK's GDP figures for the second quarter of 2009 will be released. At his monthly press conference, Prime Minister Gordon Brown said that government action would "shorten the recession" and "reduce its impact". "We've already seen the benefits of giving families and businesses real help now during this recession," he said. "If we had not intervened and acted decisively at least half a million jobs would have been lost in this recession."